Have you been spending countless hours doing research on your perfect wedding dress? 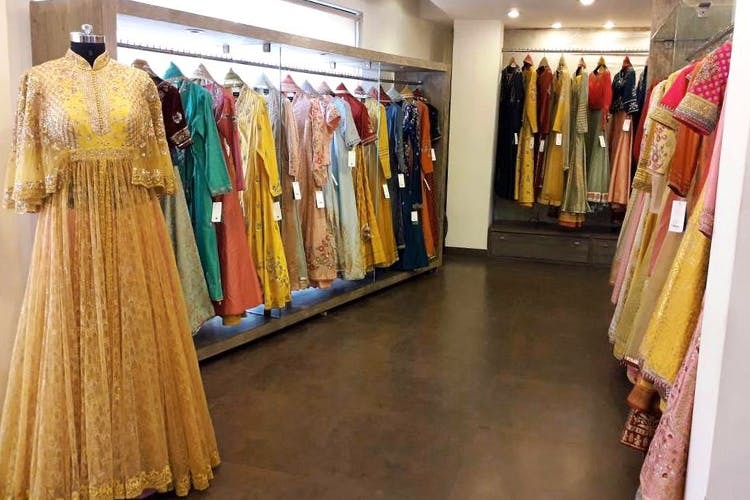 Let’s make it easier for you – Get spoiled for choice when it comes to designer bridal wear thanks to the numerous options that surround you in the cornucopia of fashion that is Defence Colony. The label, founded in 2008, has created a niche for itself for its interesting take on the Jamawar range that has become the brand’s USP. Reviewers say that the brand has a global touch, which adds to its ethnic look. Lehngas begin at INR 1,00,000, while saris are available at INR 80,000. Autre means ‘different’ in French and the brand is living up to its name by standing out by using bold colours, and experimenting with different cuts and fabrics. Brothers Shantanu and Nikhil really need no introduction. They are well known for their understated elegance and regal tastes and design wedding wear for both brides and bridegrooms. Inspired by the royal era, their designs are always a splash of colour, ranging from fuschia to midnight blue with gold work. A name that usually is synonymous with Indian fashion, Rohit Bal combines Indian traditions, coupled with western sensibilities to all his creations. He is known for designs on rich fabrics with luxurious nature-inspired motifs, and adding a bit of quirk to his sophisticated creations. He has a different collection presented at his studio depending on the season, ranging from ready-made suits and designer saris, to wedding lehngas, sherwanis, cocktail dresses and gowns. At this store, you can stitch your own designs, get ready-made bride and bridegroom attire and are spoiled for choice with fabric materials. The only catch is that you have to make cash payments. The nearly 30-year-old label has evolved to become one of the world’s leading designer brands. Exhibiting contemporary richness in design, the brand takes inspiration from India’s various cultures and heritage. Have a fixed budget. You are spoilt for choice, so the chances of you picking up more than what you want, thanks to the variety on display, is high.